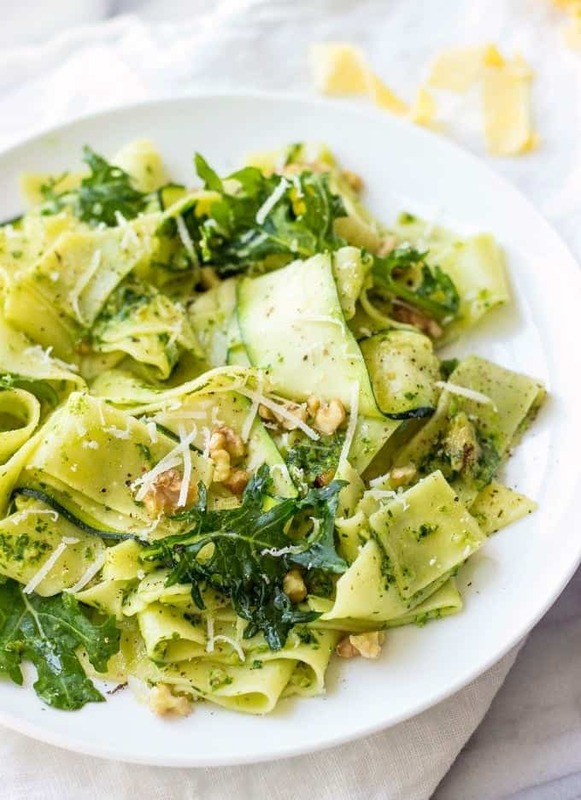 This Papardelle With Kale Pesto And Zucchini is healthy, vibrant and utterly delicious! It’s a complete meal made in under 30 minutes. Spring is right around the corner. Despite that lately, the weather has been unseasonably warm, I’m so tired of dark and gloomy colors outside. I miss spring! I want spring! Can’t wait for the trees and grass to get that nice pop of green color. If you’re like me and live in the areas of 4 seasons, I’m pretty sure you anticipate spring as much as I do. For some reason, with the arrival of spring, my urge to eat clean and healthy is bigger than ever before. Maybe because there is a bigger variety of seasonal fruits and veggies in the grocery stores. Or maybe cold days are gone or almost gone and I remind myself about that healthy eating resolutions I have yet to make. Not that I vow to stop eating desserts, I just think the timing couldn’t be better for cooking recipes that are healthier and better for you. With that being said, I’ve been meaning to share with you Papardelle With Kale Pesto And Zucchini recipe long ago. The first time I made it, I was pleasantly surprised with unusual combination of ingredients and how good they actually worked together in this pasta dish. First of all, I’m talking about kale pesto. Have you tried it before? I bet not. For me, kale is a type of leafy green that I started cooking with relatively lately. Because of its kinda neutral taste, I mostly used it in smoothies. When it comes to pesto ingredients, basil has always been my top choice. Let’s admit it – basil is classic and you can’t go wrong with it. But for this pasta recipe, I decided to use baby kale. Just as basil, kale is jam packed with healthy goodness and just as basil pesto, – kale pesto tastes incredible. You will like it. Now, on to zucchini. I bet you’ve never tried them cooked like that before. All you need is 30 seconds in a microwave. That’s it. 30 seconds and your zucchini have cooked enough to add that nice slightly crispy yet fresh and delicious bite to the pasta. I have to admit, when I first tried this method of cooking zucchini, I was a bit sceptical, but to my surprise they turned out delicious. I definitely recommend you try this method and tell me how you like it. 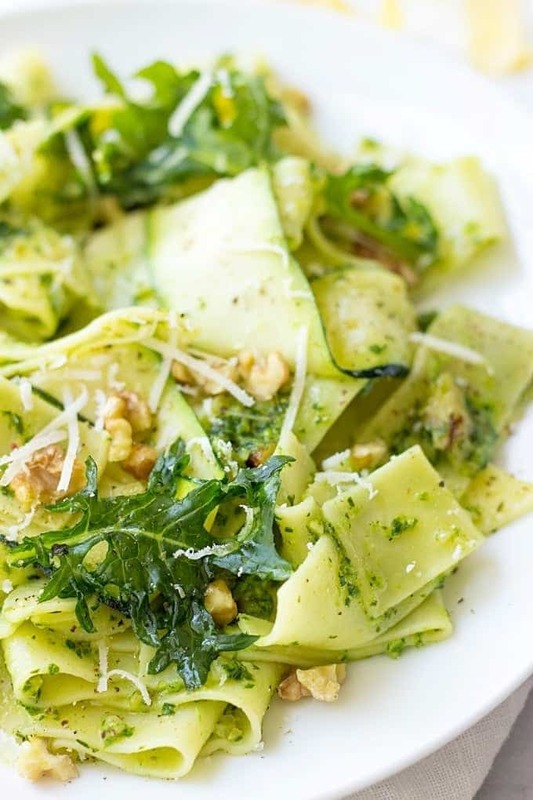 This Papardelle With Kale Pesto And Zucchini is a definitely a healthy spring recipe. It’s chock-full of vitamins. You’ve got to try it! This sounds like a delicious meal! I love zucchini so I think I’d love this!